AUTHOR INFORMATION: Robert Greenberger’s professional career began at Starlog Press where he created Comics Scene, the first nationally distributed magazine to cover comic books, comic strips, and animation. From there, he worked at DC Comics as assistant editor and editor on such titles as Crisis on Infinite Earths, Batman, Detective Comics, Star Trek, Starman, Doom Patrol, etc. Bob also worked at Marvel Comics, Gist Communications and Weekly World News. As a freelancer, Bob has written numerous Star Trek novels & short stories and a variety of SF/fantasy short fiction. Most recently, he wrote the novelization of Hellboy II: The Golden Army for Dark Horse Books. He has also written several nonfiction titles for both adults and young adults including coauthoring 2004’s DC Comics Encyclopedia. Bob also writes for SciFi.com and offers commentary on ComicMix.com. DESCRIPTION: “Criminals are a superstitious, cowardly lot. So my disguise must be able to strike terror into their hearts. I must be a creature of the night, black, terrible . . . I shall become a bat!” So declared millionaire industrialist Bruce Wayne, orphaned as a boy by a murderous thug and driven as a man to battle the scourge of crime by becoming Batman. Batman swooped into popular culture in 1939—and for nearly seventy years has thrilled audiences in countless comics, live-action and animated television programs, and seven feature films. Prowling the darkened rooftops of Gotham City, roaring through the teeming streets in the sleek, high-powered Batmobile, and leaping into action when the iconic Bat-Signal pierces the night sky, the Caped Crusader is a larger-than-life legend. And now, for the first time in more than thirty years, everything there is to know about Batman the comic book character, is collected in one comprehensive new sourcebook. From A to Z, this comprehensive sourcebook contains everything you ever wanted to know about the Dark Knight, including entries on The Joker, Amazon Girl, Catwoman, Apokolips, Robin, Doomsday, Sandman, the Justice League of America, Scarecrow, and hundreds more. There are literally hundreds of entries that go into incredible detail fleshing out and linking together the Batman mythos, including the complete details on Batman’s origins and biographies of every character, animal, place, accessory, and vehicle in the Batman universe. 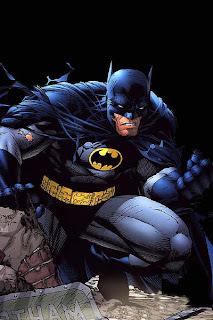 CLASSIFICATION: As the title implies, “The Essential Batman Encyclopedia” is an encyclopedia. In other words, the book is “a comprehensive written compendium that contains information on a particular branch of knowledge”—in this case, the comic book universe of Batman—which is organized alphabetically from A (Abattoir) to Z (Zur-en-arrh). 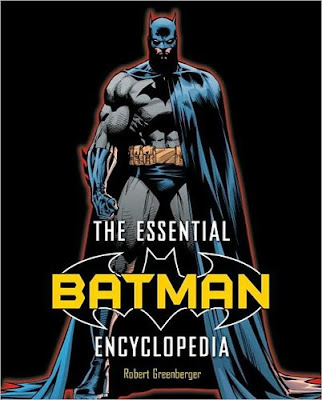 As such, “The Essential Batman Encyclopedia” is not the kind of book “that you can pick up and read from cover to cover”—as stated by Graeme in his review HERE—but it is an excellent source of information for browsing through and cross-referencing. ~Fascinating details and the complete background on Batman’s origins. ~Biographies of every major character in the Batman universe—including his closest allies, from Robin the Boy Wonder and faithful butler Alfred Pennyworth to Commissioner Gordon; and his countless enemies, from the Joker, Penguin, Catwoman, and the Riddler to Scarecrow, Two-Face, Ra’s al Ghul and Poison Ivy. ~Classic black-and-white comic book artwork throughout. ~Two sixteen-page full-color artwork inserts. For one, the encyclopedia only covers the comic book aspect of Batman. So if you haven’t been reading the comic books, you may not care about a lot of the information found in the encyclopedia. And even if you have read some of the comic books, you still might not care. I know I didn’t and I’ve read my fair share of Batman comics over the years since the 1990s. 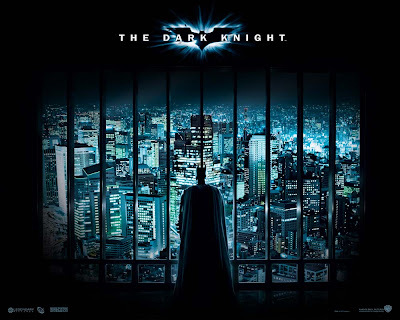 Plus, Batman is easily my favorite superhero character of all time, ranking right up there with Spider-Man. The problem you see is not so much the information that the encyclopedia gives us, but the information it fails to provide. Specifically a timeline of the different Batman comic book series and miniseries (Batman, Detective Comics, Superman/Batman, JLA, The Killing Joke, The Dark Knight Returns, etc), their storylines, and the writers & artists who worked on the various titles. 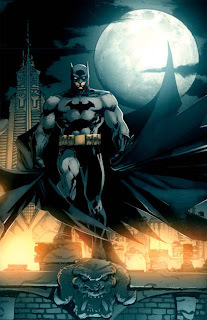 Additionally, I think it would have been more interesting to have looked at how the character has evolved over the decades, the impact that the Batman mythos has had on popular culture, and the various interpretations of Batman through different mediums like film, animation, video games, et cetera. My biggest beef with the encyclopedia though, is the lack of color illustrations—most of the artwork is depicted in black & white except for two sixteen-page full-color artwork inserts—a disturbing trend for recent Del Rey graphic novels including Terry Brook’s “Dark Wraith of Shannara” (Reviewed HERE) and Dean Koontz’s “In Odd We Trust” (Reviewed HERE). So just to be clear here, unless you’re Frank Miller or Jeff Smith (Bone), color is always better than black & white. Also, I think the encyclopedia would have been a lot more effective if there had been illustrations provided for every single entry in the book—along with the issue it appears in, artist info, etc—rather than just the more notable ones, although there are some really nice obscure pieces included. NOTE: In the future, authors Martin Pasko and Phil Jimenez will be providing encyclopedias for DC Comics other two iconic superheroes: Superman and Wonder Woman. I've never found bats in the least bit intimidating, which always made it a little tough to take Batman seriously. They're like rats or squirrels with wings---vermin at worst, cute at best, which doesn't say 'strike fear into the hearts of men' to me. :) Anyway, the latest movie looks like fun, so I expect I'll go see it. It's been a while since I last took in a Batman movie---all the way back to Keaton, I think. Yeah, I thought Batman Begins had a lot of potential, especially the beginning and the way it explored the origins of the Batman character and how it was grounded in reality. But there were some corny moments in the film that offset the serious nature of the movie, the Rachel Dawes character was just terrible, and the movie devolves into cheesy fare in the third act. I've booked myself in for the pre-pre-advance-preview screening on Weds night. £13 over here for that! I liked the fact that the origin story was long. Christian, in the office, mentioned that superhero films are the only films that have such a long back-story to the lead character. And I think it worked well in this one. "if a Batman actually existed in the real world..."